A few months back I watched this film for the first time and as I watched it again last night I thought I would take the opportunity to write about it for this website. The film is based on a book of the same name and apparently the author of the book contributed to the screenplay of the film. I haven’t read the book (yet) but a friend made the comment to me that it is “better than the film”. Well, we know that is a general rule when it comes to movies based on books – the book is invariably greater (racking my brains here trying to think of the exception that proves the rule but I’m coming up short…). 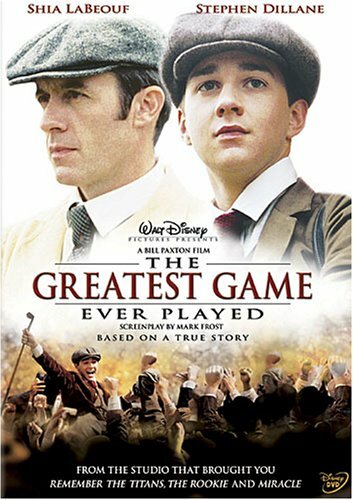 Anyway, the film portrays the story around the 1913 US Open – when a young amateur Francis Ouimet won the competition, beating legend Harry Vardon in a play-off after ending level after four rounds. The first time I watched the movie the intro sequence informed me that it was a Disney production and I had a sinking feeling. I needn’t have worried too much – while it is undeniably cheesy in parts it is not the feel good saccharine sweet mess I feared when I saw the Disney name. The film focuses on Francis Ouimet, the son of working class immigrants in suburban Boston who lives across the road from an exclusive country club and develops an interest in golf, especially inspired by Vardon, whom he has the chance to see in the flesh when his mum lets him skip school to go to an exhibition. He starts working as a caddy at the country club and his passion for golf grows. There is a background story about Vardon as well – that he is commissioned by a newspaper owner to go the US Open and “win it back for Britain”. That Vardon is also from a working class background is illustrated by the fact that despite being a celebrated competitive golfer he is unable to gain access to the more exclusive echelons of the golfing world. Ouimet is forced to give up golf for a “proper job” after he fails to qualify in the US Amateur competition he is urged to join by a club member and the caddymaster who take it upon themselves to mentor his golf progress. However, after the passage of some time (it is not clear how long, a year or two perhaps?) he is once again urged to enter a competition – this time the US Open itself. In this competition he comes up against an illustrious field – Vardon, his sidekick Ted Ray and the reigning champion, John McDermott. ***Spoiler alert*** He prevails. I’m sure you would have worked that out. According to Wikipedia there are a few minor historical inaccuracies (such as the 17th hole being a dogleg left rather than the right in the film) but it seems to be essentially true to actual events. Which makes it an even more impressive story! Since getting back into golf I have been interested in watching golf films – I don’t watch any TV these days so I do need the occasional bit of entertainment! I have to say the The Greatest Game Ever Played is a particularly enjoyable one. It depicts the events of over a hundred years ago but every current day golfer can relate to the highs and lows experienced by Francis Ouimet. The Vardon back story to me seems a bit superfluous – it kind of explains why he has respect for Ouimet’s achievements while the rest of the golfing scene seem intent on seeing Francis fail – but I am not sure it really adds that much to the film overall as it doesn’t really do much with the social inequality aspect. The film is quite long at just over two hours so I think it could have been trimmed down and just focused on the competition? There is also a kind of love interest which is introduced but then not followed up on. TGGEP is definitely one of my favourite golf movies and I would recommend watching it. Just don’t expect anything too deep – it’s a good yarn and thoroughly entertaining which is fine by me.